How to add Apps, Games, Extensions, and Themes in Google Chrome. If you have not checked out the Google Chrome Web Store - you should. It has a lot of amazing features. Over the next week I will be highlighting some for you. 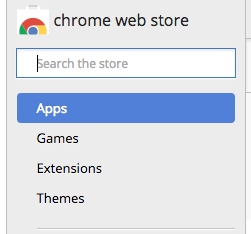 In today's post I will be showing you just how to access the Chrome Web Store. You can access the Google Chrome Web Store by clicking here or by clicking on the Google Apps shortcut (if you have it available on your screen). If you do not have the shortcut -watch the GIF below - right click underneath your url box (Omnibox as Google calls it) and check Show Apps Shortcut. In case it was difficult to see in the upper-right hand corner of my screen is the shortcut and it looks like this. To add an App or Extension simply click on the Web Store and you will see a list of Apps, Games, Extensions, and Themes. See picture below. Watch the below to see the steps to see how easy it is to get to the store. You will see some of the Apps that I have installed a few seconds in. See you tomorrow with an extension that will "turn off the lights" when watching a video on YouTube.